Easy and secure way to convert olk14message file into msg file format. Simply download the olk to msg converter tool on your system. Then perform the required step and software will automatically provide you resultant msg file. The tool ensures entire data conversion quickly. Brows the olk folder or .dmg file and software will list all folders in folder list pane. View the entire scanned data and then either export entire data into msg format or select only required files and then click on export button. The software will convert only selected files or folders. After successful conversion software will provide naming convention option to save obtained msg file. User can save exported files by its subject, date, from and combination of these attributes. You will find this option in the advance setting section of software. Software enables user to apply date filter before converting olk file to msg format. Simply select the date range and the software will include only those files which were shared during the specified dates. Use can find this option in advance setting window. 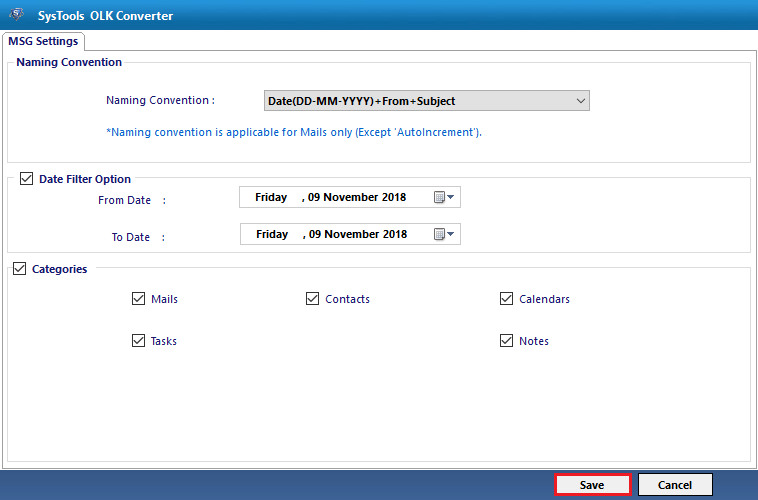 OLK Emails to MSG converter software enabled with advance feature to maintain the folder structure same in the resultant msg file. User need to just check the maintain folder hierarchy option before exporting olk file and software will save all exported data in same folder structure as it was saved. If user want to convert only either mails or calenders then software enabled with category selection feature. 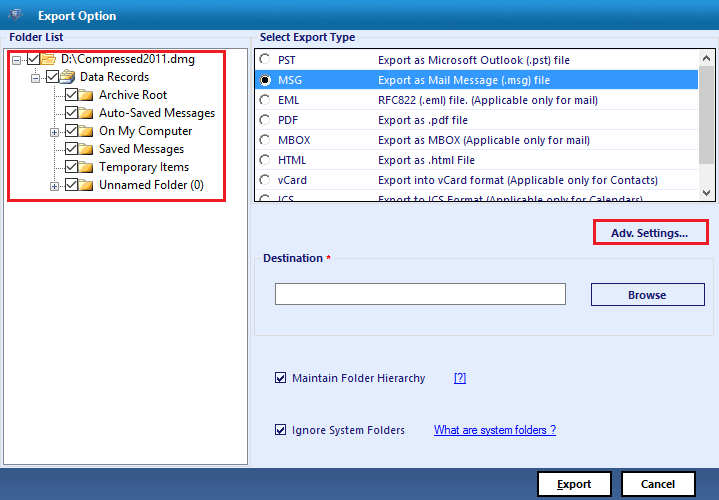 Here user can select either Mails or Calenders and the software will convert only selected category data into msg format. User can find this feature in advance setting of software. 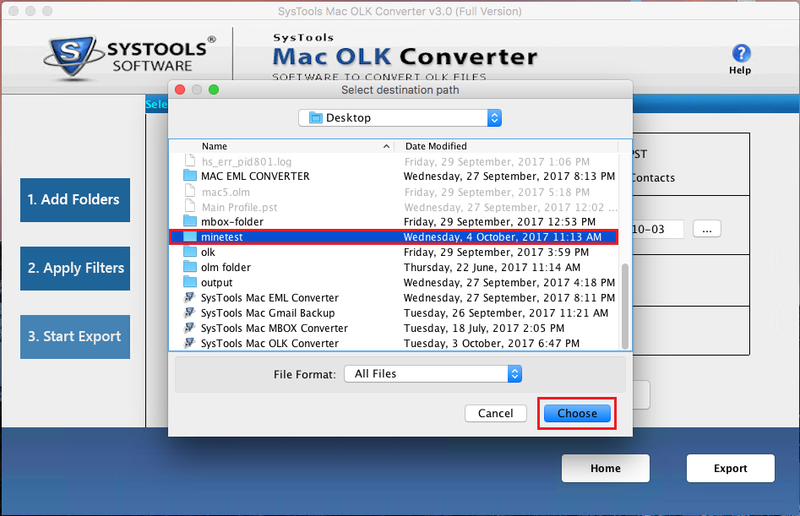 Is software support conversion of olk file created by Mac Outlook 2016 version? 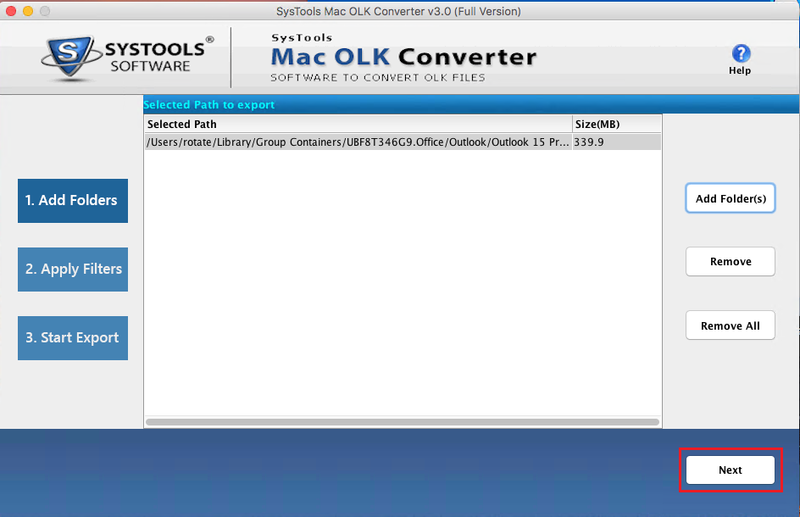 Yes, The tool support both mac outlook 2011 and mac outlook 2016 olk file to msg conversion. Where will the software save resultant msg file? The software will provides both option to save resultant file either at the same location where olk file saved or provide the path where user need to save it. I have .olk file but software is asking for .dmg file. What to do? In this situation you can select folder option and then brows olk file. But it is time taking process in case of many olk files. Otherwise the simplest way is compress the olk file and you have .dmg file. Now brows all files at once. I am not able to find olk file in my system. What is the location? Can I export only emails from olk file? Yes, software enabled with categories selection feature. Select emails option and the software will include only emails in conversion. Install the software on your local machine, and home window will be appear like this. Click on Add File button from menu bar. 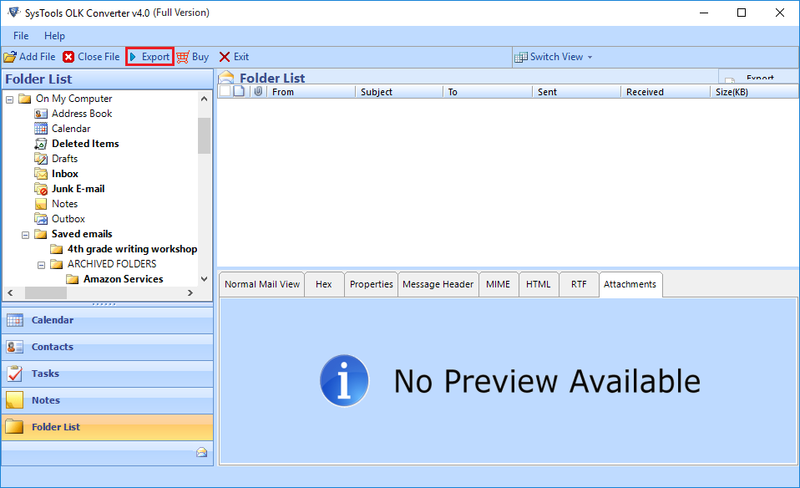 Select option to browse the Outlook olk files. Now the software will show the complete scanning report in new pop up. View all scanned folder in Folder List Pane and select the folder that containing data. If you want select mails then check required one otherwise software will convert entire data. Click on the Export button from menu bar. Now select the MSG radio button and hit on Adv. Setting to apply advance features. Now check the required feature like Category, Date Filter and Naming Convention and click on the Save button. Now provide the destination location by clicking on Brows button. Also Check the list from the Data Record, Archive Root etc. And then click on Export button. Now the software will show the successful export process report. Simply click on the OK button and exit from the software window. "One day I need to access some old olk file data. I am not able to access single file from the bunch of olk file. Then I searched solution to fix this issue. Thankfully I found OLK to MSG Converter Software and converted entire data into msg file and accessed required data, thanks to the development team." 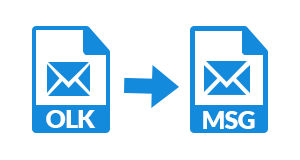 "I was searching for olk to msg export tool that can convert olk14message and olk15message. I installed this software on my system and converted entire data into msg format. I liked most the naming convention and selected file recovery feature. Want to thank support team because they helped a lot." 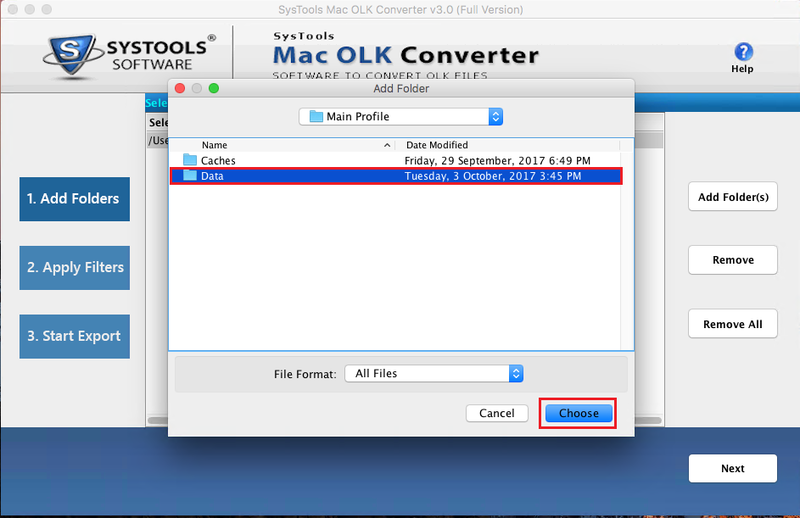 The OLK to MSG Converter for Mac helps to convert OLK14message & olk15message to MSG format file. Moreover, it can extract and move all items from OLK data files i.e., emails, contacts, and calendar to MSG format. This exporter is capable enough to transfer OLK File as an original source file while converting olk15message to MSG type. This migrator tool offers an amazing feature to add and migrate multiple .olk14 / .olk15 files at a time. There is no size limitation imposed while converting OLK file to MSG on Mac OS, which restricts a user to browse the unlimited number of files. Users can select Add Folder option for browsing OLK data file in bulk. 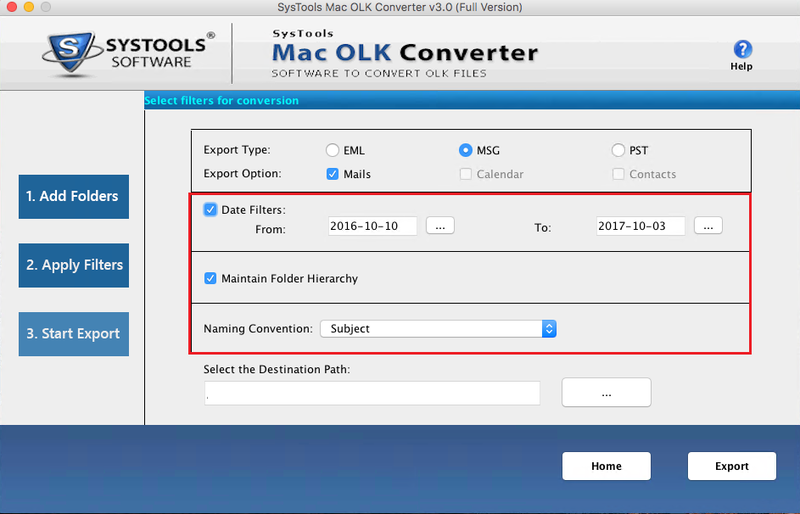 Mac OLK to MSG Converter software provides an option of selective conversion in which emails of specific date range will be stored in MSG format. Meanwhile, one just have to mention the time duration i.e., ‘From’ to ‘To’ and afterward, migrator will filter emails automatically from browsed .olk files. With the help of this Converter tool, users can save exported OLK15Message / Olk14Message files into MSG format in the specified naming option. The software renders multiple naming conventions to save data files with the desired name. Normal users can convert olk14 or olk15 files to MSG format in the required way. 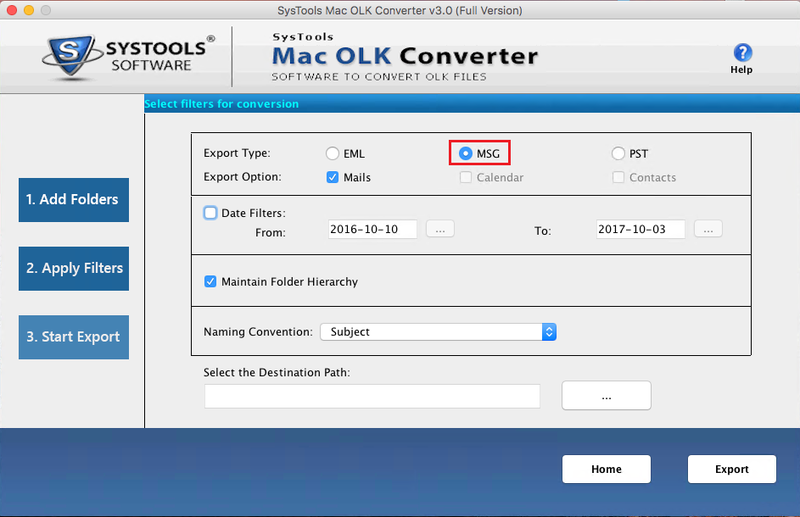 Mac OLK to MSG converter allows that it can hold the OLK folder structure throughout the migration procedure. It means this software is not going to affect the folder hierarchy when exporting .olk file to .msg type. The file structure before and after migration will remain same throughout the procedure. This conversion tool is designed with a simple, user-friendly, and easy-to-use interface. Additionally, it provides a simplified and understandable layout, which helps to remove all the challenges and easily export olk to msg format on Mac OS machine. Is it possible to convert multiple OLK files to MSG format simultaneously? 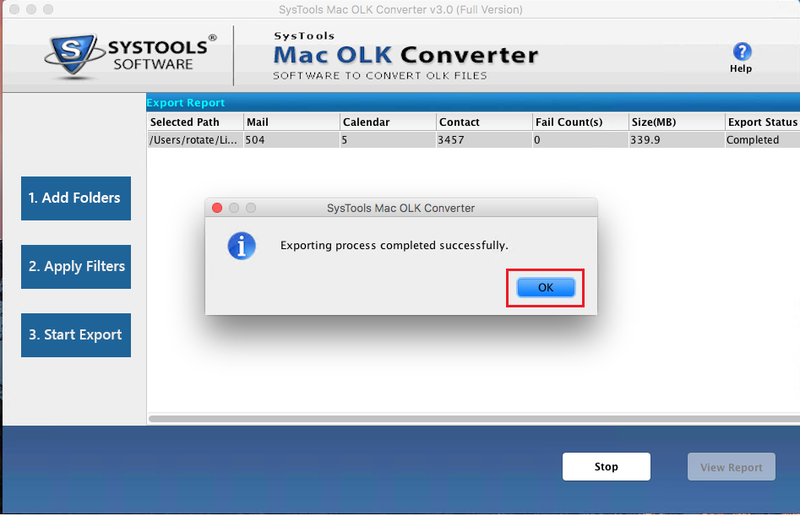 Yes, Mac OLK to MSG exporter tool can easily transfer one or more OLK files to MSG format at a time. Does this software retain the folder hierarchy throughout the conversion process? Yes, Mac OLK file to MSG migrator tool allows to maintain the original structure during the conversion. With Mac OLK to MSG converter, can I save my exported OLK files to MSG in a desired naming pattern? Yes, this software offers naming convention while exporting .olk files to MSG format. Even you can save the exported file into MSG format with the desired naming option. Can I migrate only selective .olk files into MSG format? Yes, Of Course, you can easily move selective .olk files without any fear of data loss. Meanwhile, the bulk conversion is also possible with this exporter tool. Will this converter tool export multiple OLK files of a specific date range? Yes, our application provides "Date Filter" feature so that a user can select those emails that fall within a specific date range. Then, Browse to the location were the OLK files in Mac are saved. Select the folder and hit Choose. 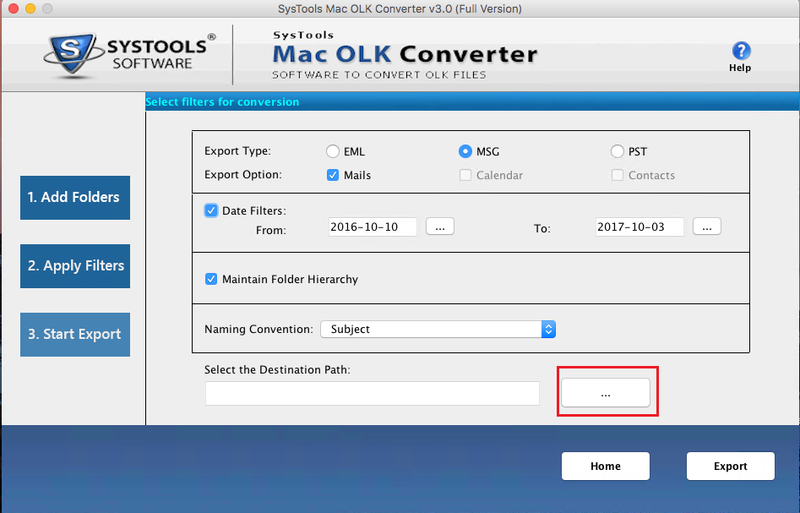 View all the OLK14Message files added to the OLK to MSG Converter for Mac tool with path and size. Then, click Next button. 1. Date Filter: To restrict Outlook OLK File Mac to a certain time period based on ‘Received date’ of emails. 2. Maintain Folder Hierarchy: Optional to keep folder structure intact in resultant MSG emails. 3. Naming Convention: Set a naming pattern for resultant output MSG files based on a number, subject or date. 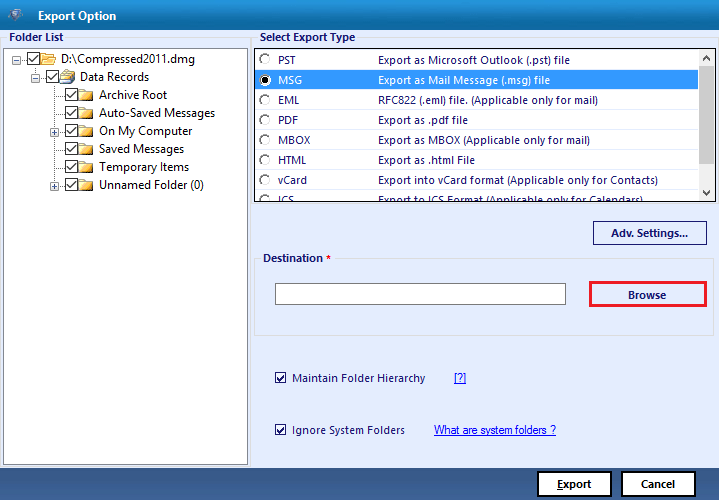 Next, click on the ‘...’ button to set a destination location where the emails will be saved after OLK to MSG conversion. After selecting an appropriate folder path, click on Choose button. The path will be displayed in the text box area after Destination path. Then, click on Export button. After the OLK to MSG Export process has been completed successfully. Click on the OK button to confirm the message box. To save the OLK15 to MSG export report, click on View Report button. This will open a folder explorer window were the OLK14 to MSG Transfer report is saved in CSV. Get the export report and view complete conversion process report. 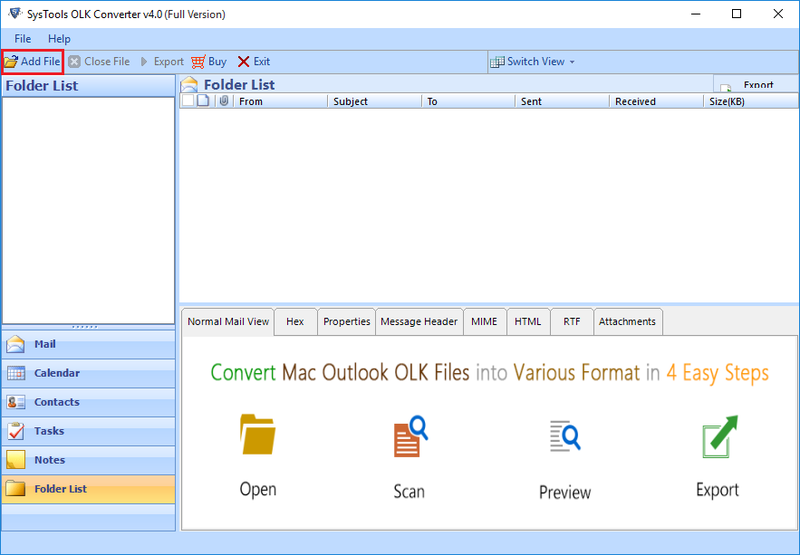 "I was searching for a solution that can export multiple Mac outlook OLK file to MSG format. After this, I came across this amazing tool and it provides date-based filtering option. So, I wish to suggest this trouble-free software to all who wants to convert multiple .olk files to .msg format in bulk without any inconvenience. Excellent Solution!!" "Working with Mac OLK to MSG Converter was a great pleasure for me. It has incorporated with a simple and interactive interface and faster while exporting multiple .olk to .msg file format. Although I can also perform the selective conversion with the date filtering option. Additionally, a non-technical user can execute the bulk conversion using this amazing software. Thank you such much!!"